For Peter and Jenny Young, diversification has always been a key factor in growing their business. In 2004, a few years after taking over the family farm, they had a dairy herd of 65 cows farming 71.6ha of land, including 12ha of tillage. They began to look at options for the future but concentrated on keeping costs down, out-wintering all cows on kale and Italian ryegrass. From 2003 to 2006 they followed a once-a-day (OAD) milking programme to reduce the labour involved. "The OAD system is a great system and it is worth looking at," said Peter, with growing interest in the programme throughout the country. For the farm, organic was an opportunity to increase production as Glenisk had spare capacity so they were not hampered by quotas. It was 2004 when they began thinking about converting to organic before taking the leap in 2006. "Once you are in, you have to play by the rules; to get there, you have to make sure you are ready for them. We made a lot of silage, we made sure our Ps and Ks were up to date, our lime was good. So we basically got ourselves ready over two years to go into organic," he said. Peter Young talks to the group during Teagasc Organic Dairy Farm Walk. Photo Roger Jones. They moved from 50 to 100 cows and went into winter milk as it was a requirement for their supply to Glenisk. "We calved 20 or 25 cows, it was a token gesture of winter milk," he said, adding that they applied for grants for a milking parlour and roadways. Now they have grown the total farming area to 107.5ha, with a spring calving herd of 170 cows and heifers, with oats also grown for the organic porridge market. They bought in around 700-800 straw bales last year, which was another way of boosting Ps and Ks. "The market is the biggest challenge in organics, while management is also a challenge," he said. "You don't have the fertiliser bag, but you have a lower stocking rate, a lower output. You won't grow grass like a conventional farmer, you'll grow about 8-9t. We have access to dairy sludge. "With dairying in particular, you are selling a lot of Ps and Ks out the farm gate," he added. The farm is not driven by milk yields, as that would mean feeding more meal, with an organic barley, peas and beans mix coming in at €520/t last year. Last year, around 270kg was fed, normally it is in the region of 200kg. Jenny Young checks out the new calves. Photo Roger Jones. After they exited winter milk in 2015, around 45pc of their pool went organic and the rest conventional. Last year, around 78pc went into organics. "You do need a 20pc premium on organic milk versus conventional milk over time to justify it," he said, with the average organic price working out at 42c/l last year. Peter pointed out the Little Milk Company feels there is a strong market for organic cheese but there are difficulties in getting it produced. "Organics, while it is growing, it is still a very small niche. There was potential," he emphasised, looking at the German and French market where a lot of the cheese is sold. In the past they used a lot of New Zealand Friesian, plus used to use Jersey on heifers for ease of calving. However, a lot of high EBI Friesian bulls have been used in more recent times. On Farm were Joe Metcalfe, James Mc Donald, Peter Young , Tom Fallon. Photo Roger Jones. "We are not looking for extremes, we are looking for good fertility," he said, adding they have been seeking 400kg of milk solids in recent years. "Production is secondary, going in calf is first," he said. "I'm milk recording mainly for SCC rather than protein." On the morning of their farm walk, they milked the cows through their new €280,000 24-unit parlour. It is a 20-year investment, pointed out Peter, which they wanted set up to benefit labour and management. "Too many times I've seen farmers put them in and in two or three years' time they want to add more units or expand it," he said, adding that the unit has capacity to go to 35 units. 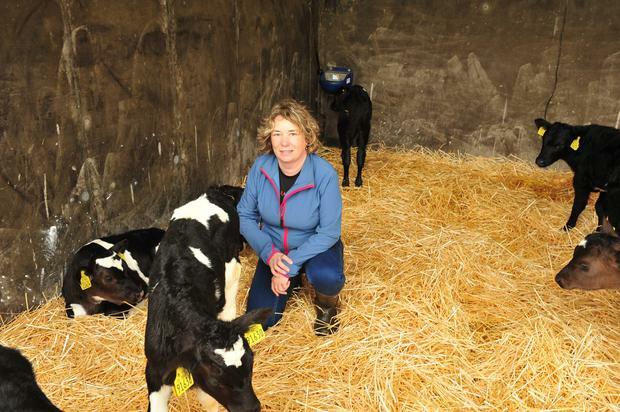 "It is about reducing labour and being smart, and that is why the investment is there in the milking parlour," he said, with one person working full-time on the farm, and another part-time. For the Youngs it is important that the premises, and the milking parlour, is a pleasant place to work for those milking. Organic dairy is a small but growing sector within the Irish dairy industry. 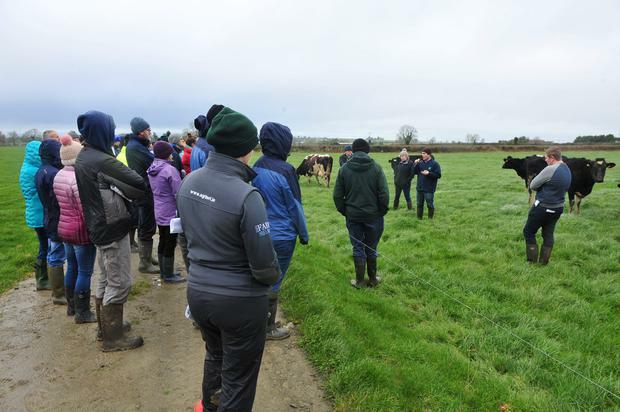 Farmers from all sectors travelled from across the country to see one of the highest stocked organic dairy farms in the country in operation on the Young family farm, near Athy, Co Kildare. 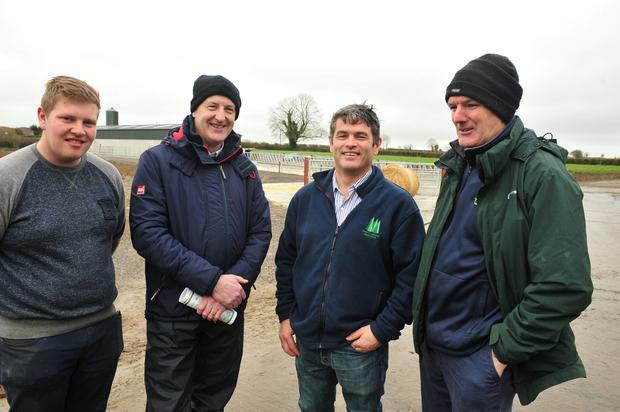 Teagasc organic specialist Dan Clavin said interest is growing strongly amongst farmers actively considering entering the organic sector, with a number now currently undergoing the 24-month conversion to organic following the recent Organic Scheme set up by the Department of Agriculture. "There is a big difference in the market opportunities depending on the crop or the animals you have. There are five organic dairy co-ops who are more than willing to talk to farmers. "We believe it is a very profitable way of farming," he said. "It is an opportunity to cut down on labour possibly and supply a growing market." However, there are challenges for those considering organic dairying. "Early grass is a challenge for nine years out of 10 in organics, this year being the exception. It is about making good use of slurry and white and red clover, which require high levels of management," he said. The organics expert explained the current market is geared towards winter milk for fresh milk and yoghurts which is a high-cost system. However, demand for milk to manufacture cheese and other products is growing. He pointed out there were a number of companies buying organic including Glenisk, Aurivo, Arrabawn, The Little Milk Company and The Village Dairy. "Stocking rate might be higher on a conventional farm so you need to get that higher price," he said. Premium prices are available for organic milk and the winter milk price has been 55-60c/l for five months up to 2018. The summer milk price has ranged from 30 to 44c/l. "It is possible in the future that there may be opportunities to supply milk into the spring market and that could come from organic baby infant formula," he said. However, he points out it is a growing sector worldwide but would involve investment at processor level to deal with organic baby milk powder. "If farmers can be offered a viable three or five-year contract, that is the main ingredient required for people to supply more spring milk," he said. "The stocking rates are low so these farmers do need a contract." Teagasc financial advisor James McDonnell advised farmers to look at where they want to be in 10 years' time before turning to organics. He pointed out many conventional dairy farmers have expanded beyond what they are truly capable of coping with. He said farmers needed to consider that questions were being raised over whether the Nitrates Derogation would be in place into the future, and what the environmental limits would be.